We’re past the halfway point in making our Celebrate sampler. This block uses the “A” from Arts n Crafts 24 in Tink’s Alphabets Eclectic and Interesting (available here). This alphabet is one of my favorites of Tink’s. I just love the way this letter is ornate while still being clean. And I just adore the way it fills up a space. I could see this alphabet used for a single letter monogram, or if you wanted the first letter of a saying to be bold and dramatic. What if you made it an illuminated letter by putting a box around it and a patterned background? The letter chart is below. I wanted the background to be something which would highlight this height by being vertical itself, so I chose a narrow variation of Linenfold Stitch. This stitch is named after Linenfold pattern, a type of carved wood pattern which mimicked the look of folded lengths of linen cloth. Linenfold is made with alternating columns of Diagonal and Straight Gobelin. The stitch can be easily varied by changing the widths of the columns’ this version uses narrow columns. I think it’s a fun and fast stitch to do. I love this project so much. I scheduled a link to this post to go live on my blog in a little while. I hope it brings you a few extra visitors. There was not an “I” as part of this project. However there are many excellent free alphabet charts on the Internet. There are also many excellent books of alphabets, including the ones from Tink Boord-Dill used for the letters in this project. 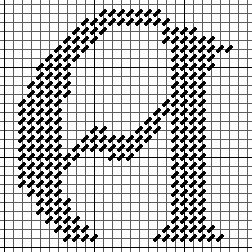 You can create your own letter from any font. Do a search for “alphabet” in the search box to the right for those articles. I also offer a custom charting service for letters, words, and names. Please use the contact form to ask about it.